The Holy Martyr John was born in 1522 in the Greek district of Epirus, in Terovo between Ioannina and Arta. His parents were pious, but he was orphaned at an early age, and he went to Constantinople. On the way he stopped in Trikala where he was accused of being an apostate by some local Turks from Islam. Somehow he escaped this accusation and with the means left him by his parents, he built a small stall in the bazaar of Constantinople and was occupied with the trade of being a tailor. He loved to work, he honorably filled all his orders, and his business was successful. However, his soul did not yearn for earthly blessings, but for the Kingdom of Heaven. St John lived during difficult times. Constantinople was under the dominion of the Turks, and Christians were subjected to oppressions. Many Christian tradesmen and merchants went over to the Muslim religion. St John reproached them for their betrayal of Christ, and he also sustained the unwavering in their faith. The apostates were filled with hatred for St John, and they desired his ruin. The saint knew this, but was not afraid. He was willing to suffer for Christ. His desire for martyrdom was answered when the men who had accused him in Trikala saw him and made their accusation, which he vehemently denied. On Great and Holy Friday he went to his spiritual Father and asked his blessing to seek martyrdom. The priest counselled the youth to examine himself and to prepare himself by fasting and prayer, so that at the time of torture he would not deny Christ. St John prayed ardently to the Lord to strengthen him. At night on Great and Holy Saturday he saw himself in a dream, standing in a fiery furnace and singing praises to the Lord. Interpreting this vision as an indication to go to martyrdom, St John received the Holy Mysteries and asked the priest's blessing. When St John arrived at the market, the vexed tradesmen began to reproach him that he had promised to renounced Christ, but that he was not fulfilling his word. In reply, the martyr declared that he was a Christian and had never renounced, nor would he ever renounce Christ. He then climbed onto a minaret and began to chant "Christ is Risen! ", since it was Pascha, and his voice echoed through the city. They sentenced the martyr to be burned alive that day. St John met his sentence with joy on Pascha. When they led him to the blazing fire, he went boldly into the midst of the flames. A neighbor, who was afraid his house was going to burn down, ordered the fire be extinguished immediately, so they pulled John out half burned. They lit another fire elsewhere, but John ran towards it to throw himself in. However Greeks bribed the officers to have him killed quickly by beheading so he would not suffer so much, and they beheaded John with the sword (April 18, 1546). They then threw the martyr's head and body into the fire. Christians gathered up the ashes and bones of the martyr which remained from the fire, and reverently buried him in the City. His skull is now in the Monastery of Varlaam on Meteora. 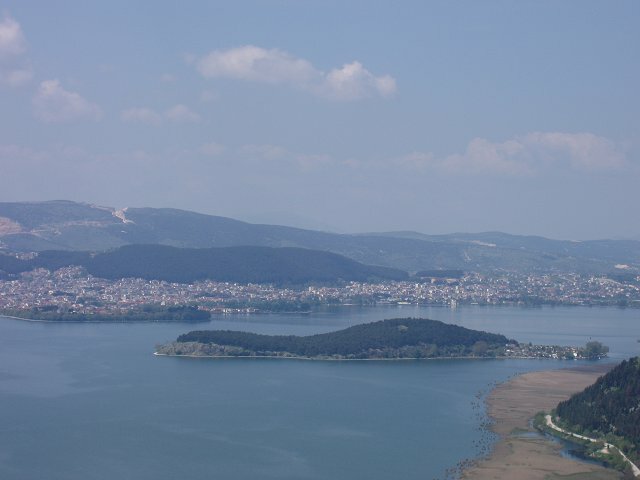 There is also small portion of his relics at Panagia Eleousa Monastery and an icon of him at Philanthropos Monastery, both on the island in Ioannina Lake [pictured below]. From sinful darkness, cleanse me by suffering! But wed me with the sufferings of Your sufferers. That, as an impregnable wall, I be firm. Into your ranks, receive me also! Yours is the sword and fire - here is my body! Let us praise with joy the holy new martyr John, for as a heavenly craftsman he fashioned for himself a martyr's crown which he offered to the Lord on Holy Pascha. Exalted for his faith, we now beg him to pray for us that our souls be saved.